This post comes from Sara Randall, an independent natural resource consultant specializing in commercial fisheries, food systems, and sustainable economies and is now based in her home state of Maine. 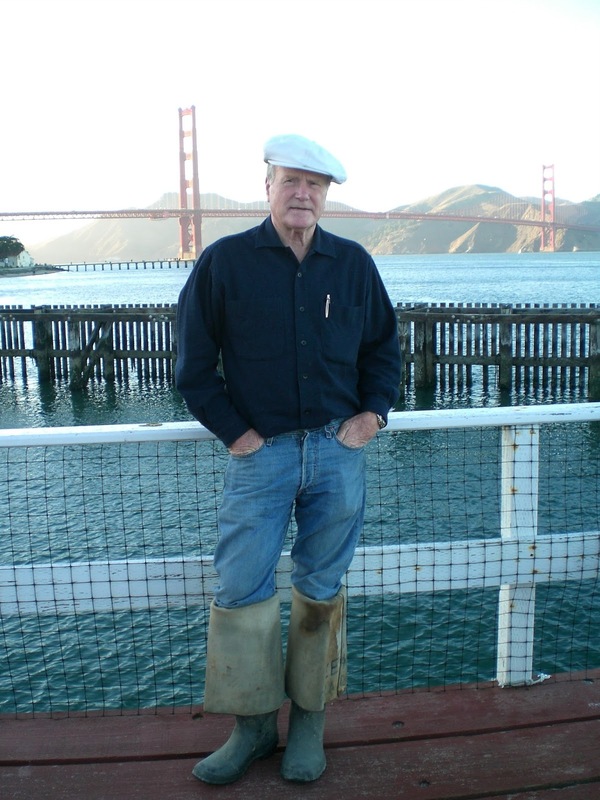 Last month, we saw the passing of Zeke Grader, a champion of our nation’s commercial fisheries, our fishing men and women, healthy ecosystems and the public trust. I first met Zeke when I started working with him at the Institute for Fisheries Resources (IFR) and the Pacific Coast Federation of Fishermen’s Associations (PCFFA) in the fall of 2002. It happened to be right in the middle of Klamath River fish kill, the largest man-made fish kill in known western history. I vividly remember answering distraught phone calls from those on the ground in the region relaying the gruesome scene of 65,000 adult spawning salmon and steelhead lying dead and decomposing on the banks of the Klamath and Trinity rivers. This ecological disaster was the result of the Bush Administration, through Bureau of Reclamation, allowing water diversions for irrigation to Klamath Basin ranchers and agri-business in clear violation of the Endangered Species Act (ESA). Always on the side of fish and fishing families, Zeke led the way in bringing attention to the dangers these water diversions posed to the health of our salmon runs and ecological balance of our rivers. He correctly pointed out that these water diversions reduce flow rates and raise water temperatures, a deadly combination for salmon attempting to return to their natal streams to spawn. Never one to back down, Zeke ’s responded by initiating a lawsuit against the federal agency, and in an act that is remembered by many, orchestrated the delivery of 500 lbs. of rotting adult Klamath River salmon killed to the steps of the Department of the Interior headquarters in Washington, D.C. As I came to learn through my time working with Zeke, his career was characterized by this kind of bold and tenacious advocacy as a modern day warrior for our wild-caught fisheries. Over the better part of the next decade, I had the privilege to continue working with Zeke as the Director of Programs at IFR, during which time we literally tackled every conceivable issue that affected the health and productivity of our fish bearing waterways and fishing communities. Throughout it all Zeke never tired or lost an ounce of passion and somehow managed to maintain a strong presence on local, regional, national, and international stages. Zeke was an effective and tireless advocate for fishing families and the environment they depend on. He devoted countless hours advocating for the modernization of the MSA. Zeke’s efforts led to securing federal disaster relief for fishing families after the loss of fishing seasons due to water mismanagement on the Klamath and Sacramento rivers, and more effective oil spill prevention and response policies. 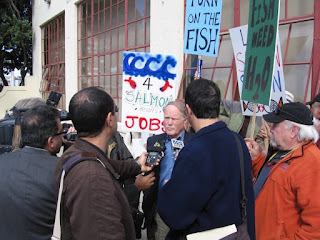 Together we worked on efforts to warn consumers about the dangers of ocean salmon farming, to create a national organization for commercial fishermen, to stop the FDA’s approval of genetically engineered salmon, and to include fisheries in the sustainable food movement. Zeke warned of the of the negative social, economic, and environmental consequences of unfettered expansion of catch share fishery management systems, and pushed for the establishment of Community Fishing Associations as a method for communities to maintain fishing access. Zeke wasn’t afraid to take important issues to court and lead the charge to legally protect fisheries, especially when it came to accelerating the painfully slow process of water quality restoration under the Clean Water Act. 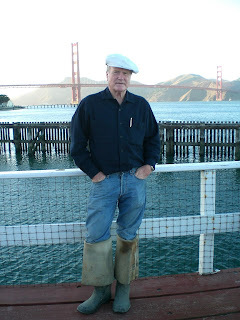 He was a master of utilizing locally-caught fresh seafood to connect decision makers to commercial fishermen and to illustrate the importance of keeping our aquatic ecosystems healthy. During my tenure, PCFFA & IFR worked for dam removal on several important salmon bearing waterways, including spending many years at the negotiating table for the removal of four dams on the Klamath River. The resulting dam removal agreement, the 2010 Klamath Basin Restoration Agreement, would be the largest dam removal project in history and plans to open 420 miles of salmon habitat. Dysfunctional water rights policies required Zeke to spend a lot of time working for fewer water diversions and increased water flows on salmon bearing rivers and streams. This work pitted Zeke against powerful and deep-pocketed agri-business and urban water districts, as well as resistant state and federal agencies and, as others have noted, Zeke never flinched. Despite the long battles he was so often forced to engage in, Zeke never lost his humor and would always take time to have in-depth conversations and build community. Zeke often hosted “Beer Fridays” in his office overlooking San Francisco Bay where he would relay war stories with old friends and impart knowledge on younger workers. As most who witnessed Zeke in action know, he was not afraid to speak truth to power and did not mince words in doing so. As just one example, in 2006, when the regulators were trying to close the commercial salmon season due to the 2002 Klamath Fish Kill, Zeke pointed out that without efforts to address the water over-allocation that led to their decline, “putting fish back into a river that's killing them makes as much sense as tossing virgins into a volcano". Later he also was quoted as saying, "There is, in fact, more evidence for the low flows killing these fish than there is for Iraq having weapons of mass destruction”. Grader with Jane Lubchenco, Pietro Parravano and Sara Randall. Using his characteristic wit, he was able to summarize and boil down complex regulations, policies, and scientific concepts in a way that allowed lay people to understand while at the same time placing the issue into the broader political, social, and economic context. He was a verbal bomb thrower and his spoken acuity could singlehandedly change the dynamic and direction of public discourse. Zeke was so verbally nimble and quick on his feet that few dared to debate with him in public. At the same time, his deep intelligence and straightforwardness enabled him to be a powerful diplomat. Zeke worked with and advised leaders at every level of industry and government. Innumerous times throughout his career he was able build bridges and create understanding between communities with disparate viewpoints. Through these talents he earned the respect of many, even his opponents. Before my time working with him, Zeke’s accomplishments included leading the effort to pass legislation for a conservation plan to double wild salmon numbers in California, and then used the legislation to reform the federal Central Valley Project. This work eventually led to the passage of the 1992 Central Valley Project Improvement Act (CVPIA), which reserved 800,000 acre-feet of water for the environment and is known as the most important water policy reform legislation ever passed by Congress. In 1998 Vice President Al Gore presented Zeke with NOAA’s Environmental Hero Award. One of Zeke’s greatest legacies is the number of young people he directly mentored and inspired. Through the years that I worked for him Zeke directly mentored over 20 individuals, many of them coming from the AmeriCorps Watershed Stewards Project (as I did), and later from the Golden Gate University School of Law. It is clear that Zeke made an impact on their lives and careers long after their stint at IFR came to an end. Most continue to work in the natural resource field for commercial fishing groups, environmental organizations; and regional, state, and local government. In memorializing Zeke, his friend Leon Panetta said, “if our oceans are the ‘salt in our veins,’ Zeke Grader is the fire in our spirit”. Indeed, Zeke’s legacy demonstrates the difference one person can make in the world through perseverance and determination. He will be missed by many. Here's more about Zeke's life and work from The Scuttlefish, the Santa Rosa Press Democrat and the LA Times. A Sneak Peek at BoatToSchool.org!